Africason | African School | Africa son | History | Black Consciousness | Education: Does Sudanese Culture Identify More with Arabic or African? Does Sudanese Culture Identify More with Arabic or African? It’s hard to claim that South Sudanese culture is Arab or African in a globalized world where it’s very difficult to claim cultural uniqueness as a group, let alone a group such as South Sudan which blended with the North for more than a decade. Deng Aling weighs in on this contentious identity discussion. Speaking about culture leads us right into speaking about identity. The identity discussions were hashed out over decades in cultural and academic spheres in Sudan before the secession of the South to form the Republic of South Sudan. The discussions have a historical backdrop, deeply rooted in the minds of many Sudanese about the identity of Sudanese culture; if it’s Arab or African. Although it may be difficult to validate each of the two claims, many Northern and Southern Sudanese writers and researchers contested to identify and associate Sudanese culture. Many claimed that Sudan is an Arabo-Islamic country, thus the culture is associated with the Arabs. Southern writers refuted these claims, calling for the Africanization of Sudan which is rooted in the dark continent. If culture is a man-made set of traditions and norms passed on between generations, then being African has more to do with the geographical ties than cultural ones. The same applies to bring Arab; whereas it is a sentimental affiliation to some groups. In defending Sudanese Arabism, Abdo Badawi writes about his historical research on Sudanese roots “God awarded Muslims three Sudanese kingdoms, namely: Fonj, Fur and Taqali kingdoms. They played a massive role in spreading Islam to vast lands in Africa, and planting Arab values as well.”1 His research relied on Northern Arabic and Islamic poetry and writings. Bakri Khalil echoed Badawi by noting that Arab civilization alleviated African civilizations, especially prior to the rise of liberation movements in Africa. He adds that African awareness was “limited and mysterious, thus Arab-Islamic civilization expanded African values and norms in light of atrophy of creative renewal movements that considered civilization a safety belt and lifeline in a world full of waves of modern cities”2. These narratives were engraved in many Northern minds, with Southern minds imprinting the same lines of thoughts. Many thought that the Arabo-Islamic policies enforced by General Abood in Southern Sudan in 1958 were a form of unifying the country’s identity; in reality they robbed the country of its full cultural components. Affiliation to Islam and speaking in Arabic doesn’t change a person’s identity and does not necessarily mean being an Arab. Dr. Dhieu Wol 3 thinks that “the Southern identity is certainly African; being part of Sudan and speaking Arabic does not mean the Southerners are Arabs”. He thus oversees Abood’s attempts to Arabize the South by forcing the Arabic language and traditional dress as well as the Islamic holiday on Friday instead of the Christian Sunday- all uncommon in the South at the time. Francis Deng analyzed the Sudan’s Arab ways as an incorporation process. He wrote “the process started as a product of intensive interaction with Arab traders in the North, who propagated the culture, traditions and social relations. Arabs came from a far away land which was rich in innovations and products that reflected their advancement in contrast to Sudanese ways”4. Although this rings true, it can also be explained by many factors, namely overt Sudanese chauvinism. Thus the history of Arabization and Islamization of Sudan remains a complex process of local interactions and external links especially with Egypt 5. The South was not spared from these intimate interactions of Arabo-Islamic cultures with African ones. The identity discussion on whether Sudan was Arab or African came to an end after the secession of the South. The Southern identity resistance began in Sudan before the Egyptian-British colonialism, when the South was a hotbed of slave trade. The resistance continued on during the colonial period 6, regardless of Gordon’s futile efforts to ban the trade. The first real communication between the Southern and Northern cultures was during the Mahdi time after he fought off and evicted the Turks. Southerners called the Mahdi “Madi” and likened him to “Deng Dit” a mythical good omen in Southern folklore. Although the Mahdi failed to halt the slave-trade, he remained a salvation figure in folk Dinka songs. Communication between the North and South has continued until today. However, discussions and research on whether the Southern culture is Arab, African or a mix of the two has also dwindled. Perhaps this is due to many writers proposing that the South, or more accurately Southern culture- has now become purely African after separation from the North. In my opinion this is a mistaken theory. If you look at South Sudanese culture you’ll find that African culture is deeply embedded – in traditions, music, drums and dancing – although some of these aspects are threatened with extinction. On the other hand, Arab culture is also ingrained in the South, starting with literature, short stories, fiction and poetry. Many young literary professionals are fluent in Arabic even though the Southern literature isn’t as rich as the Arabic one in the North. The North boasts many literary icons such as AlTayeb Salih, Mohamed AlFitouri, Idriss Mohamed Gamah, Mahgoub Sharif, Abdel Aziz Baraka Sakin and others who contributed to Arab literature with their novels and poems. In the South, there are a handful of writers such as Taban Lo Liyong who gained a lot of fame in East Africa and the West with his poetry and critical writings, but he was not well known in Sudan except in small literary networks. There is also Agnes Lukudu who stopped writing, Arthur Gabriel and Stella Gaitano. It’s hard to claim that South Sudanese culture is Arab or African in a globalized world where it’s very difficult to claim cultural uniqueness as a group, let alone a group such as South Sudan which blended with the North for more than a decade. Today, there are Arab ways of cultural expression; such as the style of dressing and tens of Arabic words that pepper many Southern languages. Although the Southern languages are written in Latin alphabet, but Arabic words undeniably mingle loosely. The same goes with Western culture, which permeated the South with Christian names such as David, Daniel, James and others brought with missionaries during colonial times. Then you have the pure African aspect of the Southern culture. Today’s world is moving towards acculturation; where cultures blend together freely. This is what Jurgen Habermas calls the “inclusion of the others”, where we build relations with an other which is completely different than us, but the result of this relationship is valuable. Thus, it becomes difficult to refer to the Southern culture as definitely Arab or wholeheartedly African. 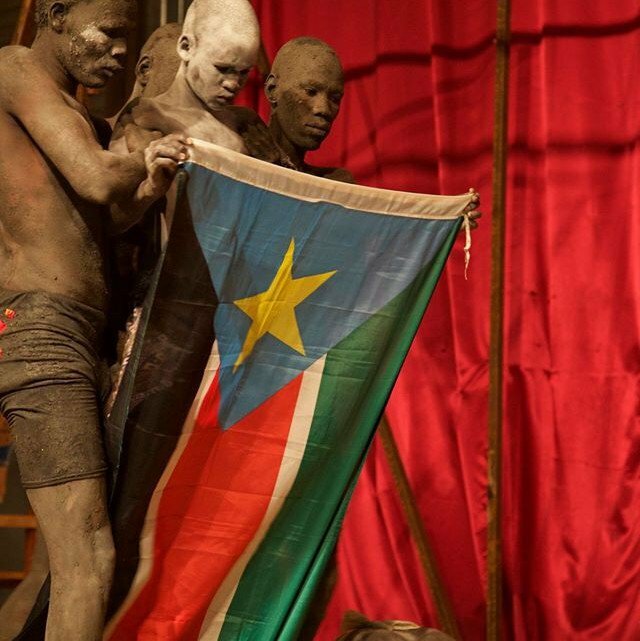 The culture of South Sudan isn’t purely Arab, or purely African, it is a humanistic culture that absorbed values from cultures to its East and West. Abdo Badawi: Poetry in Sudan, page 16. Bakri Khalil: Self Awareness and Sudan’s Cultural Identity, page 17. Dhieu Wol: Politics of Ethnic Discrimination in Sudan: a Justification for the secession of South Sudan, page 111. Francis Deng; War of Visions, page 42. Same as 4, page 63. Same as 4, page 71. This article was first published by Andariya and has been republished here by their permission.